We were stunned when the chief pediatric oncology told us that her chances of survival were zero. 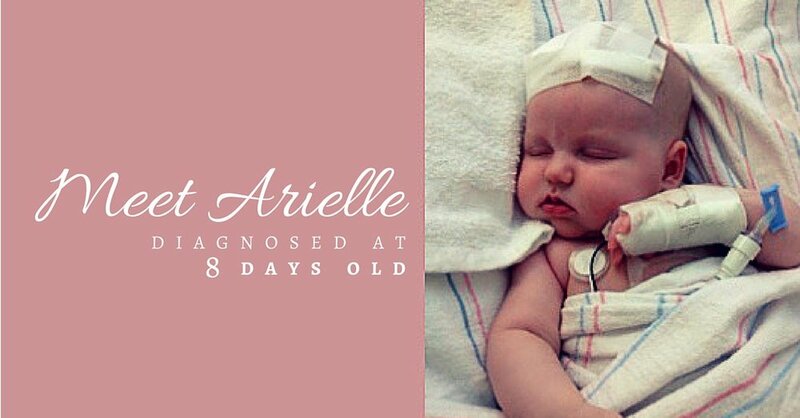 My daughter, Arielle, was born in 2013 with no complications. One week later, I fell down the stairs while holding her, prompting a trip to the emergency room. The exam led to the incidental discovery of an aggressive brain tumor, and the next day we were stunned when the chief pediatric oncology told us that her chances of survival were zero. She was eight days old. My husband and I couldn't give up without giving her a chance, and we opted to have the tumor biopsied. The bewildering results could not be interpreted, even by the leading expert at the Johns Hopkins Division of Brain Tumor Research. We transferred our daughter's care to Dana Farber, where the neurosurgeons extracted nearly all of the tumor, and identified it as an exceedingly rare tumor called a congenital intracranial teratoma. These tumors arise from a single germ cell that grows into the disorganized components of an embryo, and they are described in medical literature as universally fatal in newborns. Since there is no treatment protocol for such a disease, a world-renowned teratoma specialist from Chicago was consulted, and he presented her case at an international convention in London. My daughter survived six brain surgeries, a tumor relapse, and a host of secondary morbidities including diabetes insipidus, seizures, hydrocephalus, and left sided weakness. Thankfully, these issues were temporary. She is now a healthy, precocious toddler, with no noticeable side effects. Few are so lucky. There are less than ten known survivors, and Arielle is the only one without any noticeable effect on her development.